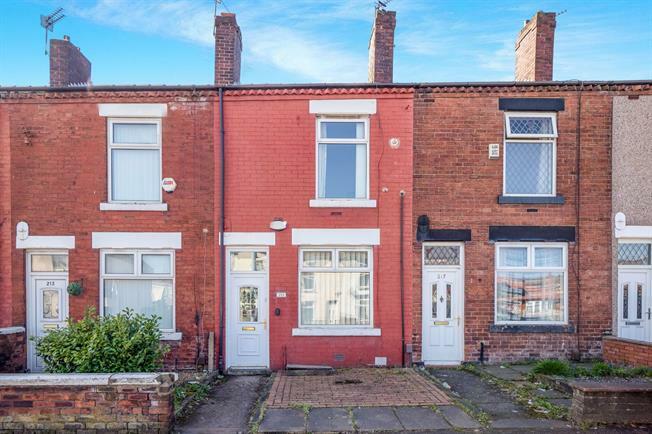 2 Bedroom Terraced House For Sale in Manchester for Offers Over £80,000. This good sized three bedroom mid terraced property is a must see for all buyers, set back from the road, ideal for a buyer looking to put their own stamp on a property. The property features a lounge, dining room with a extended fitted kitchen and ground floor WC. Three good sized bedrooms to the first floor with separate bathroom. There is a block paved garden to the front, enclosed rear garden with garage. This is an ideal home within a fantastic location to suit all buyers looking for a project. UPVC front double glazed door, opening onto the garden. Carpeted flooring. Radiator, carpeted flooring, under stair storage, ceiling light, open plan to kitchen. UPVC back double glazed door, opening onto the patio. Double glazed UPVC window facing the rear overlooking the garden. Radiator, vinyl flooring, tiled walls, ceiling light. Roll edge work surface, fitted wall and base units, single sink with mixer tap and drainer, space for electric oven, space for washing machine. Double glazed UPVC window with opaque glass facing the rear. Vinyl flooring, shelving, tiled walls, ceiling light. Low level WC. Loft access . Carpeted flooring, built in storage cupboard with water boiler, ceiling light. Double bedroom; double glazed UPVC window facing the front. Radiator, carpeted flooring, built-in storage cupboard and boiler, ceiling light. Double bedroom; double glazed UPVC window facing the rear overlooking fields. Radiator, carpeted flooring, shelving, ceiling light. Heated towel rail, carpeted flooring, tiled walls, ceiling light. Low level WC, panelled bath with mixer tap, shower over bath, pedestal sink with mixer tap. Set back from the road with block paved garden area, enclosed rear garden with garage.